Sometimes, you just need something fast and easy for dinner. This week is fairly busy, and now that I'm back into the swing of things after being sick, I really didn't want to be loaded down with lots of dinner prep. This soup is really very easy and doesn't use a lot of ingredients; in fact, I'll bet you have most of them floating around your pantry somewhere. I paired it with mushrooms on toast, which I'll be writing about next week. You definitely want THAT recipe; super easy, cheap, and oh my goodness so delicious. 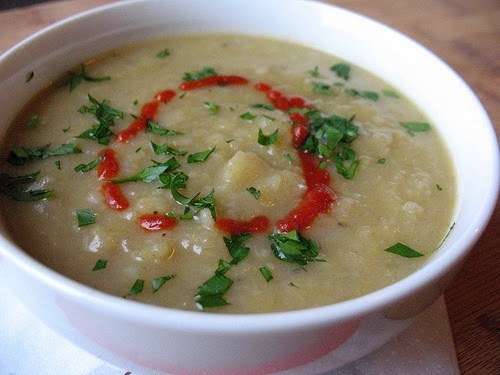 The soup has a decidedly onion-y flavour to it, so if you are opposed to that, maybe use 1 less leek and an extra potato. The measurements are kind of approximate, because you can't really go wrong here. Add a little hot sauce, if you wish. More stock, if it's too thick. You'll figure it out. In a large, deep, frypan, saute the leek and onion together in a bit of olive oil until softened and translucent. Add the thyme, and the peeled and chopped potato. Pour in the stock and bring to a boil. Turn down the heat and simmer the soup about 10-15 minutes, until the potato pieces are softened. Take the pan off the heat and let the soup cool. Adjust the seasoning with salt and pepper. Whiz up the soup in a blender (be careful if it's hot!) and pour back into the pan, re-heating before tucking in. We had ours sprinkled with a little fresh parsley, alongside mushrooms on toast. Kevin suggested that it would be very good with a grilled cheese sandwich, or you could try it with toasted crusty bread and a poached egg. However you choose to enjoy it, the soup is a nice quick dinner on a cold, blustery day.